Many consider the political memoir genre to be obsolete since they rarely reveal anything new or noteworthy. However, Carnegie Mellon University’s David Kaufer and the University of Maryland’s Shawn J. Parry-Giles' analysis of Hillary Clinton’s two political memoirs, "Living History" and "Hard Choices," has discovered links to the U.S democratic presidential candidate’s public perception problems. Published in the National Communication Association’s Quarterly Journal of Speech, the new study identifies two contrasting writing styles with one underlying theme: Clinton’s guardedness. Kaufer and Parry-Giles uncovered that both memoirs were written with a future presidential run in mind. They also found that the writing styles reveal specific challenges for female political candidates. For their analysis, Kaufer and Parry Giles, professor and chair of the University of Maryland’s Department of Communication, used DocuScope, a CMU-developed digital humanities tool to statistically tag, examine and visualize text for rhetorical patterns. They found that "Living History," which spans Clinton’s childhood through her years as first lady, was written in the Boswellian approach, meaning it delved into her most intimate thoughts. "Hard Choices," written to recount her tenure as secretary of state, used the Plutarchian style of focusing on the leader’s public service performance. "But that is only the beginning of the story," said Kaufer, the Paul Mellon Distinguished Professor of English in CMU’s Dietrich College of Humanities and Social Sciences. "Our important finding was the interweaving of the styles across both memoirs and Clinton’s choice to employ an institutional style when a disclosive personal style was not only expected but hyped by her publishers. "For example, 'Living History’s' chapter on the Lewinsky scandal reveals a litigator style pressing the case against Kenneth Starr more than the personal style of a betrayed spouse," he added. "And her chapters on a future vision for America in 'Hard Choices' emphasize more the continuation of the visions of the two presidents she served than a vision of her own." Kaufer and Giles see gender as playing a role in these style options and decisions. "Clinton has been attacked for being too much of a ‘policy wonk’ and not revealing enough about her personal life in her memoirs," Giles said. "But this is really a by-product of the ‘double bind’ women face in politics. Women in politics, like Clinton, often find they can’t be too intellectual or too emotional — or too serious or too jovial." The authors propose that, "because of the binds they face, it is easy for women candidates to be pushed back into pragmatism to remain 'appropriate.'" 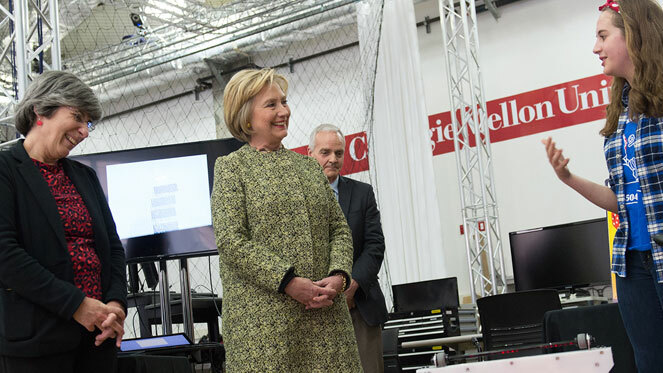 Pictured above is Hillary Clinton at Carnegie Mellon University during a campaign stop.